Impala (plural impala or impalas) is the common name for a light-built, swift-running, powerful-jumping African antelope, Aepyceros melampus, characterized by a reddish brown fur with white on underside, chin, and tail, and long, ridged, lyre-shaped horns borne by the males. They range widely in south-central Africa, found in the savannas and plains with dense clusters of trees and shrubs of many nations, from northeast South Africa north to Kenya, Uganda, and the Democratic Republic of the Congo. Impalas provide important ecological functions, serving as food for big cats (leopards, cheetahs, lions), hyenas, wild dogs, and crocodiles. They also are hunted by humans for their meat. As such, impalas reflect the principle of bi-level functionality, providing a larger function for the ecosystem and for humans while also advancing their own individual functions related to survival and reproduction. Impalas are particularly renowned for their remarkable leaping ability demonstrated when being pursued by predators. They can jump more than 2.5 meters (eight feet) in height and ten meters (30 feet) in length in a single bound, in almost any direction. Their speed, agility, quick turning, and high and far jumps add to the wonder of nature and makes the impala an often featured attraction in wildlife documentaries and depictions of Africa. Impala ram from the Kruger National Park, South Africa. Impalas are a type of antelope, a diverse group of typically hollow-horned, slender-built, and swift bovids native to Africa and Asia. Antelope species do not form a taxonomic group but are spread throughout the subfamilies of the Bovidae family (bovids) of the order Artiodactyla (even-toed ungulates). All antelopes have long, slender legs and powerful muscles where the upper legs meet the body, providing leverage and increasing leg stride and speed. Impalas are medium-sized antelopes and are lightly built. They range from 40 to 80 kilograms (88-176 pounds), with a body length of 120 to 160 centimeters (4-5.3 feet), a shoulder height of 75-95 centimeters (2.5-3.1 feet), and a tail from 30-45 centimeters (12-18 inches) long (Grzimek et al. 2004). Males are larger than females. Impalas are reddish-brown in color, have lighter flanks and white underbellies with a characteristic "M" marking on its rear. There are black stripes down the forehead, ear tips, tail, and thighs (Grzimek et al. 2004). Only males have horns. These are long and curved in the shape of [lyre]] and can reach up to 90 centimeters (36 inches) in length. In general, the horns range from 45 to 92 centimeters (18-37 inches) (Grzimek et al. 2004). Antelopes are known as fast runners that are good at quick, precise turns, and they can run very fast for extended periods of time. The impala exhibits this characteristic, but in particular is renowned for being a powerful jumper that can leap distances more than nine meters (30 ft) and 2.5 meters (eight ft) high (Grzimek et al. 2004). Impalas, as with other antelopes, are ruminants. Like other ruminants, such as cattle and goats, they have well-developed cheek teeth or molars, which grind cud into a pulp. They have no upper incisors or canines; in order to tear grass stems and leaves, their lower incisors press against a hard upper gum pad when they bite. The scientific name, Aepyceros melampus, comes from the Greek αιπος or aipos, meaning "high"; κερος or ceros meaning "horn"; melas, meaning "black"; and pous meaning "foot." 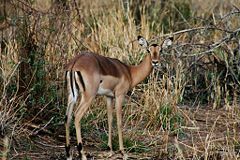 The name impala comes from the Zulu language. Impalas are found in savannas and thick bushveld (well-grassed plains dotted by dense clusters of trees and tall shrubs) in Kenya, Tanzania, Mozambique, northern Namibia, Botswana, Zambia, Zimbabwe, southern Angola, northeastern South Africa, and Uganda (where they are the source of that country's capital city's name, Kampala). Impalas generally prefer ecotones between open grassland and woodland. They require cover and surface water (Grzimek et al. 2004). A herd is normally an indicator of water close by. Impala ewe from the Kruger National Park, South Africa. 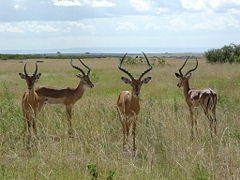 Impalas are among the dominant species in many savannas. They can adapt to different environments by being grazers in some areas and browsers in others. They graze when the grass is green and growing and browse at other times. They will browse on shoots, seedpods, and foliage. Impalas can thrive in areas where pure grazers can not survive. Impalas are active during both day and night and are dependent on water. During the dry season, they drink at least once a day (Grzimek et al. 2004). Herds will use specific areas for their excrement. Leopards, cheetah, Nile crocodiles, lions, spotted hyenas, and wild dogs prey on impalas. There ability to run swiftly, make swift turns, and leap high and long provides a mechanism of escape. 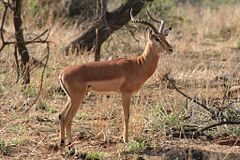 With the ability to jump up to 2.5 meters high in any direction, including over bush and even other impala, they can flee their predators and also escape into dense vegetation (Grzimek et al. 2004). 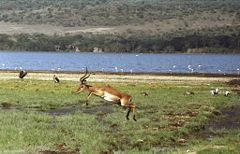 When frightened or startled, the whole impala herd starts leaping about in order to confuse their predator. Females and young form herds of up to two hundred individuals. When food is plentiful, adult males will establish territories and round up any female herd that enter their grounds and will chase away bachelor males that follow. They will even chase away recently weaned males. A male impala tries to prevent any female from leaving its territory. During the dry seasons, territories are abandoned as herds must travel farther to find food. Large, mixed tranquil herds of females and males form. Young male impalas that have been made to leave their previous herd form bachelor herds of around thirty individuals. Males that are able to dominate their herd are contenders for assuming control of their territory. The breeding season of the impala, also called rutting, begins toward the end of the wet season in May. The entire affair typically lasts approximately three weeks. During intense mating periods, the males vocalize loudly, making a sound between a dog's bark and a lion's roar (AWF). While young are born after seven months, the mother has the ability to prolong giving birth for an additional month if conditions are harsh. When giving birth, a female impala will isolate herself from the herd despite numerous attempts by the male to keep her in his territory. The impala mother will keep the fawn in an isolated spot for a few days or even leave it lying in hiding for a couple days, weeks, or more before returning to the herd. There the fawn will join a nursery group and will go to its mother only to nurse and when predators are near. Fawns are suckled for four to six months. Males who mature are forced out of the group and will join bachelor herds. Impalas have a life span of about 15 years (Grzimek et al. 2004). In the past, taxonomists have put the impala in the same tribe as gazelles, kobs, and hartebeests. However it was found that the impala was so different from any of these tribes that it was put in its own tribe, Aepycerotini respectively. Usually two subspecies are distinguished, which is supported by mitochondrial DNA analysis (Nersting and Arctander 2001). These are the black-faced impala (Aepyceros melampus petersi) and the common impala (Aepyceros melampus melampus). While as a species the impala has a conservation status of Lower Risk/Conservation Dependent, being fairly numerous over large parts of their range, the black-faced impala is considered Vulnerable due to habitat loss and degradation (Grzimek et al. 2004). African Wildlife Foundation (AWF). n.d. Impala African Wildlife Foundation. Retrieved November 23, 2008. Arkive. 2008. Impala (Aepyceros melampus) Arkive. Retrieved November 23, 2008. Estes, R. 1991. The Behavior Guide to African Mammals, Including Hoofed Mammals, Carnivores, Primates. Los Angeles, The University of California Press. ISBN 0520058313. Grzimek, B., D.G. Kleiman, V. Geist, and M.C. McDade. 2004. Grzimek's Animal Life Encyclopedia. Detroit: Thomson-Gale. ISBN 0307394913. IUCN SSC Antelope Specialist Group. 2008. Aepyceros melampus In IUCN, 2008 IUCN Red List of Threatened Species. Retrieved November 23, 2008. Nersting, L.G., and P. Arctander. 2001. Phylogeography and conservation of impala and greater kudu. Molecular Ecology 10: 711–719. This page was last modified on 29 November 2008, at 00:07.